To calculate a temperature anomaly, the real absolute temperature is needed. So the real absolute temperature is available. But climate scientists keep it a secret. Why is this? 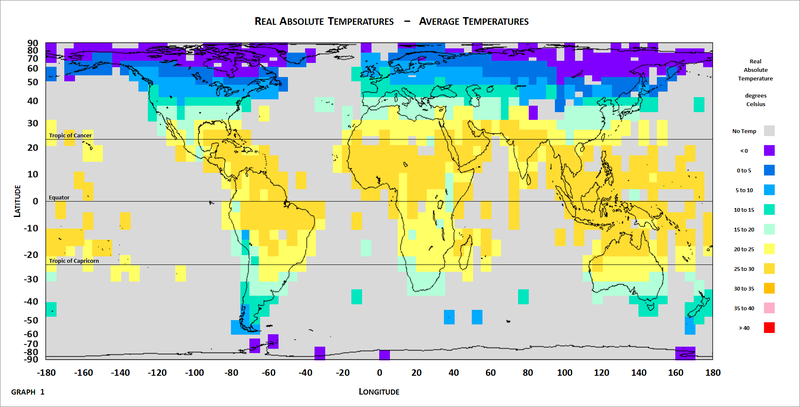 The following map shows the real absolute average temperature, for every 5 x 5 latitude-longitude cell, that has at least one temperature station present. The entire 5 x 5 latitude-longitude cell will be coloured to show the average real absolute temperature of all the temperature stations in the latitude-longitude cell. Cells with no temperature stations (e.g. the ocean), will be coloured grey. Remember, the colour will indicate the real absolute AVERAGE temperature for the whole year (i.e. it is an average of the summer, winter, autumn, and spring temperatures). If you would like a bigger version of this graph, then click the link below, and it will open in a new tab.